This item cleans easily with mild soap and water. The verbs are active in form: don’t scare instead of am not scared, eats instead of is eaten, cleans instead of is cleaned. But the meaning is passive, because the subject is not performing the action of the verb, but is on the receiving end: the speaker is not doing the scaring; the soup is not doing the eating; the item is not doing the cleaning. Brassil argues that needs done is more like scares easily than like needs to be done. I disagree. Middle voice and passive voice have in common that you don’t have to express the agent of the action (indeed, that’s a primary reason for using middle or passive instead of active). But they differ in several ways (aside from the obvious one of having active vs. passive morphology), and Brassil makes his case by showing that in most of those ways, needs done patterns with the middle voice rather than the passive. Most, not all. First, let’s look at the property where Brassil says that needs done acts like a passive. It has to do with “agent-oriented adverbs”. In the sentence Paul Sereno wrapped the dinosaur bones in plaster to protect them, the purpose infinitival phrase to protect them is talking about Paul Sereno’s purpose. So far so good. Now make the sentence passive: The dinosaur bones were wrapped in plaster to protect them. Does to protect them now refer to the dinosaur bones’ purpose? No, it’s still talking about the purpose of whoever did the wrapping; in other words, it’s an agent-oriented adverbial. However, this agent-oriented adverbial is ungrammatical when we put it in a middle-voice sentence, like the one in 3. (I’ve switched to present tense in this sentence for a reason to be explained when we get to the next property.) The same pattern holds for carefully in 7, 8, and 9. Paul Sereno wrapped the dinosaur bones in plaster to protect them. The dinosaur bones were wrapped in plaster to protect them. *The dinosaur bones wrap to protect them. Back at the lab, the technicians carefully removed the plaster jacket. Back at the lab, the plaster jacket was carefully removed. 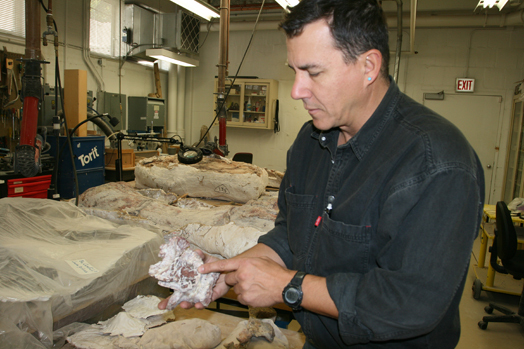 *Back at the lab, plaster jackets remove carefully. ?He scared easily when I sneaked up on him. ?The soup I had for lunch today really ate like a meal. ?The shirt cleaned easily with mild soap and water. These laminate floors need cleaned at noon. The databases needed synched at 8 this morning. To me, though, these sound as good as any other needs done construction. Of course, I’m not a native speaker when it comes to needs done, but they sound fine to my wife, too. If needs done is in your grammar, I welcome your judgments. So in short, I’m saying that: (1) the middle voice can describe episodic events, like the passive voice; and (2) second, that even if the middle voice couldn’t describe episodic events, needs done can. Again, it’s behaving like a passive. The dinosaur bones were wrapped in plaster jackets by Paul Sereno. Back at the lab, the plaster jackets were removed by technicians. *I don’t scare easily by most people. *The soup that eats like a meal by the average American. *This item washes easily by people I know. Her dress needs washed by Alexis. Rice needs cooked by Bob. Just as Hitler needed removed from power, so did Saddam. Ms. Verma asked them what questions needed answered. we will do what needs done. The car needs washed, not necessarily by you, but by someone before the weekend. I’ve written up the document, but before it goes out, it needs checked by Kim, Alex, and Sandy. As before, I welcome judgments from other speakers who have needs done in their grammar. So once again, the needs done construction is acting like the passive voice, not the middle voice. Nevertheless, I agree with Brassil that a good analysis of the construction is not one where you just say, “Oh, it’s really needs to be done with the to be omitted.” What I’d say about it is that the individual verb need (and maybe want, as well) have gained a new syntactic category: One that combines with a passive participial complement (minus a noun phrase) to produce a verb phrase. This entry was posted on January 29, 2010 at 2:32 pm	and is filed under LSA, Passive voice, Variation. You can follow any responses to this entry through the RSS 2.0 feed. You can leave a response, or trackback from your own site. She had the boy educated. John had the dog groomed. Is that not considered middle voice? I don’t think I’ve ever heard that referred to as middle voice. I’d call it a lind of causative construction. the verb implies getting or having something done [by someone else], so the middle form of διδασκω (“didasko”), meaning in the Active Voice “to teach”, in the Middle Voice means “to get [someone] taught”. Similarly, λυω (“luo”), meaning in the Active Voice “to set free”, means in the Middle Voice “get [someone] set free” (which is normally translated as “to ransom”). It is also described this way in Elizabeth Little’s book Biting the Wax Tadpole, which is where I first read about middle voice. I’m thinking it could very well be just an error, though. By golly, you’re right! I’d forgotten about these Greek examples. Yes, ancient Greek has a separate set of endings for the middle voice (though they overlap a lot with those for the passive voice), and use middle voice a lot more than English does. As Chase & Phillips put it in Lesson 25 of A New Introduction to Greek, middle voice “represents the subject as acting either upon himself (reflexive) or in his own interest….” It also mentions that there are special meanings associated with the middle voice of many verbs, and I’d venture to say that the meaning of “educate” and “set free” that you found qualify. And in English, the best translation is indeed “have someone educated” or “have someone set free” (i.e. pay their ransom), but to call this English translation itself an example of middle voice seems to me to be stretching the meaning beyond any usefulness. When I was twelve I heard my Idahoan Uncle say of a haybelly, “That horse needs rode.” Even at twelve, I wondered at the origin of his grammar. Thank you for another enlightening descent into vernacular. I believe this construction is very common in Scots (Doric, or whatever you call it), which is probably why it’s Appalachian-ish in the US. I tend to look at it as a modal variant: needs DONE instead of needs DOING – it takes the other participle, that’s all. In all the cases I’ve ever heard or seen, that one substitution makes it “grammatical” for Standard English. See, “he needs driving to work” sounds fine to me. That’s an interesting restriction on “needs doing”. Now that I think about it, I think I have that restriction, too. He needs driving to work sounds a bit weird to me, too, but it might also be because I’m not accustomed to needs [VERB]ing with other material following the verb. Yes, the “needs done” construction is definitely common here in Scotland: “the car needs washed”; “the dog needs fed” etc. By the way Scots (general word for Scottish dialects that aren’t Gaelic) does not mean the same as Doric (specific to Aberdeen area). Thank you for this post. I think it’s awesome you’ve taken the time to write up your thoughts on/reactions to my talk. It’s interesting that you come to the conclusion that the construction is ‘need’ plus a passive participle complement. My intitial analysis was essentially the same – ‘need’ plus a small clause headed by a passive participle – but my consultants were rather categorical wrt judging as ungrammatical sentences like “The car needs washed by Mary”. Because of these judgments, I abandoned that line of analysis and settled on the middle-voice approach as the most appropriate given the data I had collected. Have you recieved responses from native speakers that accept the agentive by-phrase? I’ll see what my speakers have to say about the examples you’ve come up with. And assuming there are clusters of speakers that allow for the agentive by-phrase and clusters that do not, it might be interesting to see where these dialect-boundaries are and which variety (by-phrase accepting or non by-phrase accepting) is more prevalent. I haven’t obtained any judgments other than my wife’s, so I’ll be interested to hear how your informants like the examples I created. I’ll look for opportunities to run them by other needs done speakers around here. OK, I got some more judgments, from a lifelong native speaker of needs done and an almost lifelong speaker. The example I gave was, “This birthday card needs signed before we send it out. (But Mom, I already signed it!) Yes, but it needs signed by Tom, Kate, and Jim, too.” Their judgments were: What’s the big deal? They found nothing at all out of the ordinary about the sentence. So, I’ll admit, I didn’t read this entire article. I did a google search to see if something I said yesterday was grammatically correct. I asked a nursing assistant to do something for me, she was giving me attitude and I’d had about enough of it, so I exclaimed “I don’t care! It needs done!”. She and the secretary looked at me like I had ten heads. “I think you mean, ‘It needs to be done'” they said. I argued for awhile with them about weather or not it was grammatically correct and then dropped it. They definitely called me a “hillbilly”. I am originally from Iowa and live in Connecticut now…. hummm…..
My mom and I were discussing grammar one day when I was about 12 (I’ve been interested in words for as long as I can remember) and she brought up the “needs done” issue. She hated hearing people say “these clothes need washed” and said it should be “these clothes need to be washed”. She grew up in southwest Indiana but is a strict grammarian. I grew up (mostly) in western Ohio and “needs done” was ubiquitous. I brought it up in a history of the English language class in college and my professor had no problem with it. Because of my mom, though, every time I hear that construction I mentally cringe. My boyfriend grew up in extreme southwestern Pennsylvania and he says it all the time. I have a related question. Coming from southeastern Michigan, I’m not a “needs done” user. I have “needs doing.” My question is historical. Is “needs doing” the sole remaining reflex of the progressive passive found in, for example, “My house is painting”? This form was used up into the first half of the 19th c., after which it was replaced by the innovative form “…is being painted.” The fact that “needs painted” is dialectally limited, largely to Scots and to Appalachian and Midland US, supports the contention that this is an innovation, using the past participle without “to be.” I suspect that “needs to be painted” also would not be found much before the 19th c., but I don’t have data on that. It would also represent the replacement of the older -ing passive. It really does sound ignorant. And I was amazed that everyone at my job uses the same language. It’s so annoying. I feel like this could be an episode of Sienfield. I know if Jerry was dating a girl that talked like this he’d have an issue with it too lol. Yes, I also find that people sound ignorant if their dialects differ from my own. It makes me wonder why they even went to school, if not so they could learn to speak the way I do? I’m a needs done user. Rhetorician made a comment on another forum to this effect about the “needs done” construction, and after a lot of consideration, it’s completely true for me: If something needed to be done in the future, I would say it needs to-be done. When I say something needs done, it needs to-have-already-been done. I’m not sure if this is related, but I am reminded of the phrase “Time was, …” As in, “Time was, you could ride the bus for a quarter.” I am also familiar with “Needs was…” As in, “Needs was, a quarter for the bus.” I *don’t* use it, but I’m familiar with it somehow… Perhaps my Dad used it. My point is, there is a past tense aspect here that non-users seem to miss. I’m sure there’s a better tense designation for each of those, but I’ll leave that to the linguists. Very interesting suggestion. I’m not a “needs done” user, and I was blithely ignorant of the tense interpretations you present. However, let me add that “needs done” is probably the innovative form, “needs doing” representing the pre-mid-19th c. progressive passive, as in “my house needs painting” or “my house is painting,” which was replaced by “my house is being painted. This suggests to me that your tense paradigm above is a construct. Interesting comments, Amy! I have never come across the “needs was” construction (“Needs was, a quarter for the bus.”) I was wondering if you knew of any attested examples or could find any on the web? “To be” needs to be included. To omit the inclusion is just lazy, or trendy localized vernacular to a particular group or region. This is just my opinion after seeing this usage spread infectiously amongst groups, often for a sort of self authenticating flavor. Like slang or ebonics?